Picture this: You arrive home after an exhausting day at work, hankering for a sweet quick-fix. You don't have the time or energy to make much ado of it, but you want something now and you need it to be quick and easy. Or another scenario: a friend pops in for a surprise visit. You'd love to offer her a snack, but the cupboards are bare...well, almost. You usually have a few kitchen staples and chocolates around the house. So why not whip up a 3 minute batch of microwave mug brownies?? Mug cakes and brownies were invented for just these scenarios. And who doesn't have a few stray Hershey's chocolate or chocolate chips on hand? Or maybe you have leftover candy from a party or the holidays. Why not convert them into this delicious and easy brownie? 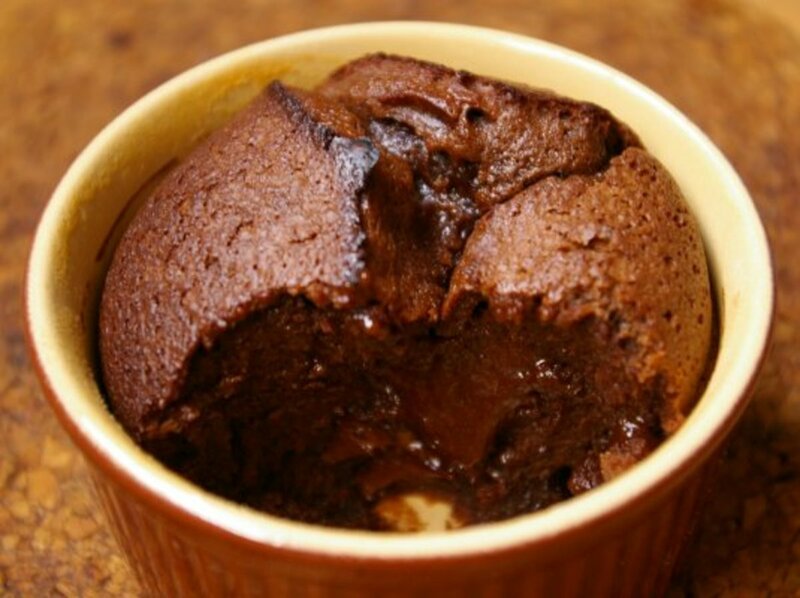 Another benefit of mug cakes: they yield just 1-2 servings which makes it hard to over-indulge and break your diet. Be warned, though: these brownies are sinfully rich! Now all you need is a 12 ounce coffee mug or two and a microwave oven. Your sweet tooth will thank you! Try Homemade Butter Caramels with Pink Sea Salt. Chewy Blondies with Chocolate Chips & Salted Caramel make an unforgettable gift. Dark Chocolate Bark With Caramelized Nuts & Sea Salt makes a quick & easy dessert. Horchata Ice Cream with Bananas & Butter Caramel Sauce and Fried Ice Cream with Sopapillas & Pear-Honey Sauce are the perfect ending to a Mexican feast. It's hard to beat Moist Chocolate Cake With Cream Cheese Frosting & Cherry Ganache Filling. You can't eat just one Soft & Gooey Maple-Oat Cinnamon Bun. Make Moist Chocolate Cupcakes with Buttercream Frosting for your next party. Your friends can´t get enough XXXtra Rummy Rum Cake. Try dark chocolate for the richest brownies. Store a bag of dark chocolate Hershey's Kisses or miniatures in the kitchen pantry so you can whip up these brownies at short notice. If you don't have chocolate, substitute 2 Tablespoons of cocoa and 1 Tablespoon of water for the chocolate. Brownies made with cocoa will have a cake-like texture. For less sweet brownies, reduce sugar by one-third. For gluten-free brownies, substitute white rice flour for the unbleached flour in the recipe. Or try equal parts corn flour, garbanzo flour and rice flour. And don't forget to use a gluten-free chocolate such as Scharffen Berger. Brownies made with butter are richer than brownies made with oil. Brown sugar adds rich, caramel flavor to your brownies. Try a combination of white and brown sugar if you'd like. If you're using salted butter, omit additional salt. Break an egg into a bowl and beat it with a fork or whisk. Use half of the eggshell to scoop out about half of the raw egg. You don't have to be very precise on this step. One-and-a-half tablespoons of egg is about half of a large egg. Refrigerate leftover beaten egg to add to your morning scramble or omelette. Mix up ingredients right in the mug for a quick brownie. When making two mug brownies, mix them up in a bowl and spoon batter into two mugs. A 1400 watt microwave oven was used for baking these mug brownies. Bake brownies one mug at a time for even cooking. Bake 50 seconds for fudgy brownies; bake 60 seconds for chewy brownies. Be careful not to over-bake the brownies. Cool brownies at least 20 minutes before eating. 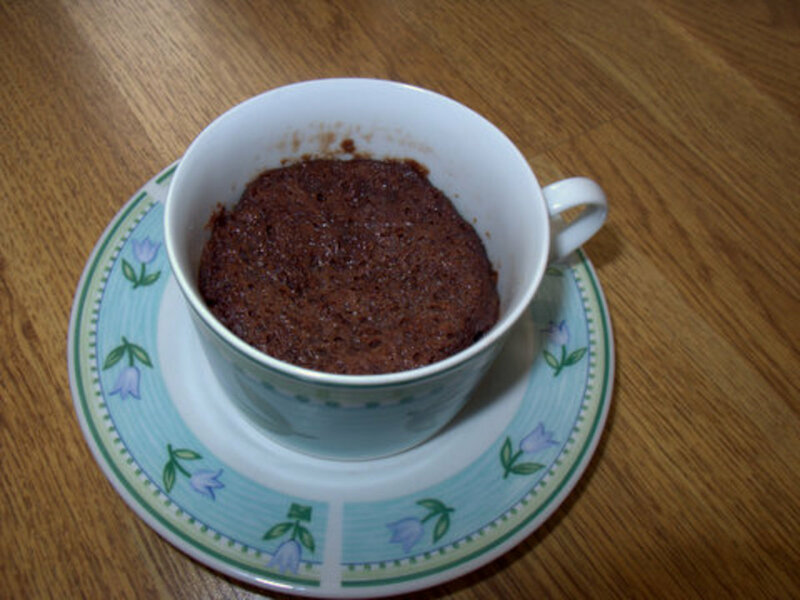 Microwave brownies in fancy ramekins, such as those seen at right. You'll have a dessert fit for guests and they'll think you spent hours slaving in the kitchen. Serve mug brownies topped with a scoop of ice cream for a special treat. Pour Kahlua, Amaretto liqueur or hot fudge over brownie sundae for a dessert that will make you popular with your friends! Stick around after the recipe for recommended brownie variations. * 1 ounce of chocolate is equal to approximately 4 Hershey's special dark miniatures, 7 Hershey's Kisses or about 3 Tablespoons of chocolate chips. Brownies need at least twenty minutes to cool. While you're waiting, why not wash the dishes and take out the trash? That will give you something to do as the aroma of cooling brownies fills the kitchen, tempting you to dig in too soon! Break or cut chocolates in half. Place in a small bowl with butter and microwave on 50% power for 1 minute. Stir until smooth and melted. In a separate bowl, beat sugar, vanilla and egg very well. Add melted chocolate mixture and beat thoroughly. Last of all, add dry ingredients (flour, optional salt and baking powder) and stir well. Evenly spoon brownie batter into two 12-ounce coffee mugs. Microwave on high for 50-60 seconds. Don't overbake. Allow brownies to cool at least 20 minutes so you don't burn your tongue. Swirl a little peanut butter or caramel ice cream topping into brownie batter before microwaving. Serve your brownie ala mode with vanilla ice cream and hot fudge or Kahlua. Mix a few chocolate chips, Reese's pieces, M&M's, toffee bits or butterscotch chips into brownie batter before baking. If you like nuts try adding roasted peanuts, walnuts, pecans, chopped macadamias or a combination. * 1/2 ounce of chocolate equals 2 Hershey's miniatures, 4 Hershey's Kisses or about 2 Tablespoons of chocolate chips. 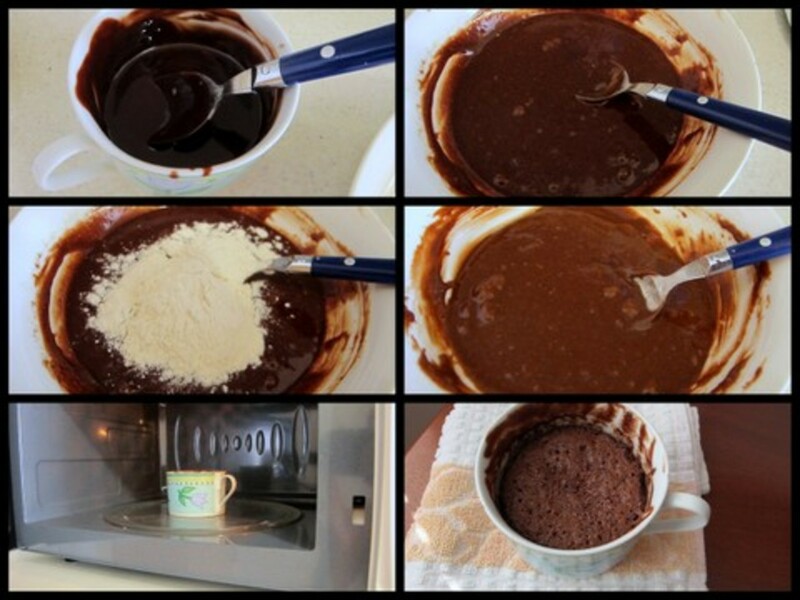 Place butter or oil and chocolate in a mug. Microwave on medium for a minute, stir and repeat until chocolate is almost melted. Continue stirring until smooth. Stir in sugar and vanilla. Add egg and beat well. Last of all, add flour, salt and baking powder. Microwave on high for 50-60 seconds, being careful not to overbake. Simply Delicious Chocolate Brownies from Scratch! Looks so delicious, i will prepare this for my special one today. Grand old lady, thanks so much for the comment and pin! It's nice to meet you in HP. I love brownies. The tips you gave also are very helpful in using this recipe. I'm posting this on my Pinterest page. Blond Logic, this is definitely the recipe for you since there won't be enough to share. My husband isn't much of a chocolate fan either! Hard to believe that's possible. : ) Thanks for taking the time to come by. I have to try this. I am glad you did a recipe for one as my husband doesn't share my passion for chocolate cake or brownies. Go figure. Skperdon, good to know! All of those additions sound delicious. Thanks for sharing. Oh by all means! I have folded in white chocolate chips, dry roasted peanuts, pecans, toffee bits, butterscotch chips, I've also used brown sugar instead. I love butterscotch and pecans and my family likes the other ingredients. I didn't add them all at once, just as requested, plus I've used them in oven baked brownies before. Skperdon, I'm glad to hear it! Please tell me about your favorite add-ins if you have a chance and I'll add them to the Hub. Well vespawoolf, I've finally done it! I've been working your cup-a-brownie recipe for a few days now, we all love it! Even added some favourite ingredients in sometimes, talk about convenience! I hope you can try it soon, Successful Living! You're reading my mind! That would make an excellent dessert presentation--and unusual, too! Successful living, I really appreciate the feedback and additional information. You could microwave the brownies in fancy little ramekins for company and they will think you spent a lot of time in the kitchen! I forgot to say that I substituted the same amount of rice flour for the wheat flour in your recipe. I'm going to use these for a cute dessert next time we have company. Really unique! Successful Living, thanks so much for your review about adapting these brownies with gluten-free flour. I will add that detail to my recipe. I found your microwave brownie in a mug recipe just the other day. I'm on a gluten free diet, so adapted the recipe using rice flour. This recipe is easily adapted to a gluten free version--and they are yummy! Daisyjae, these brownies are so simple and satisfying. I hope you and your family enjoy them as much as we do. Thanks for dropping by. The title of this hub really caught my eye! I may have to try these ~ I think my kids will really enjoy them! I love a good, tasty, simple recipe. 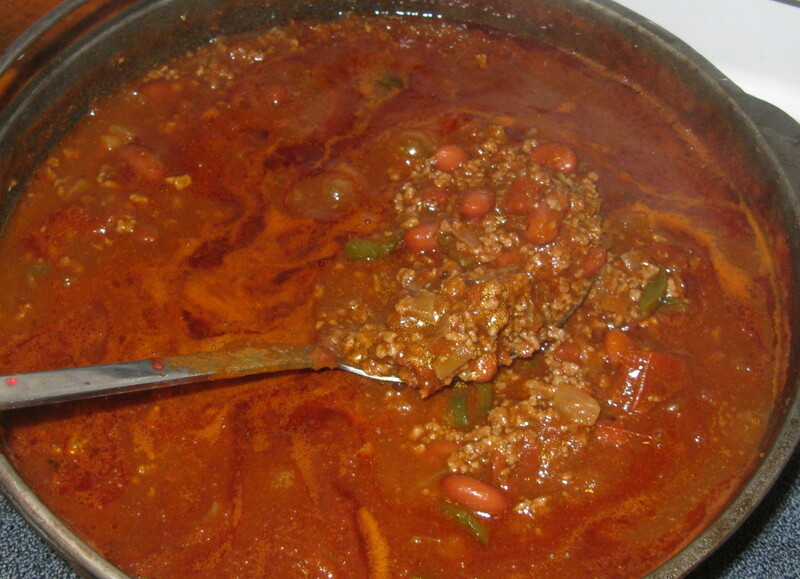 Suzanne Day, we developed this recipe during a short stint in an efficiency apartment. I hope you can try it sometime. Thanks for the vote! Thanks for this recipe, I never knew you could make brownies in a microwave with a mug! Very quick and easy. Voted awesome! 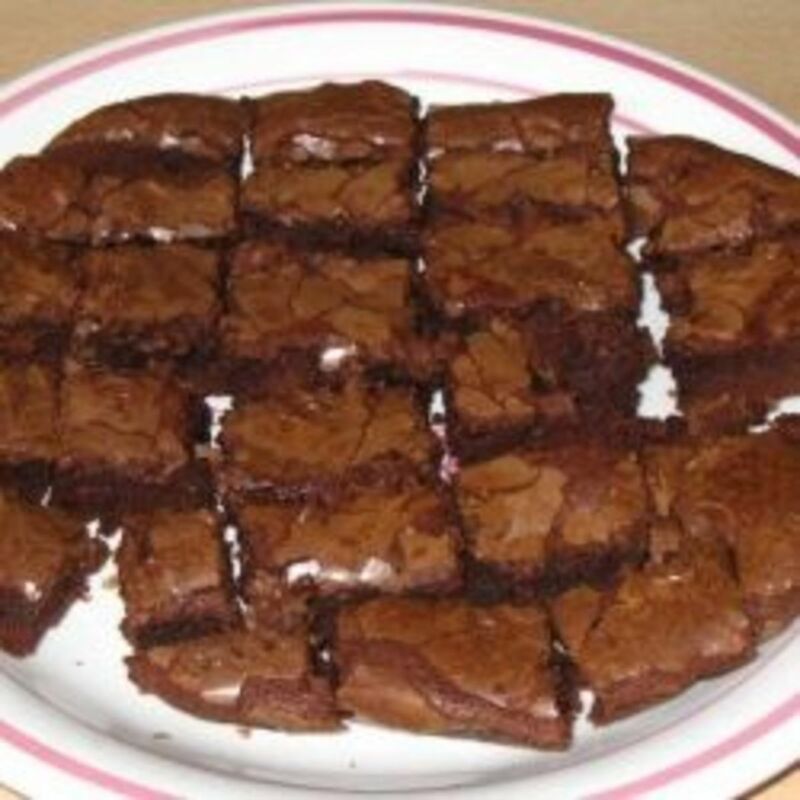 DDE, this brownie is a nice go-to recipe for a quick and easy sweet snack. Enjoy! 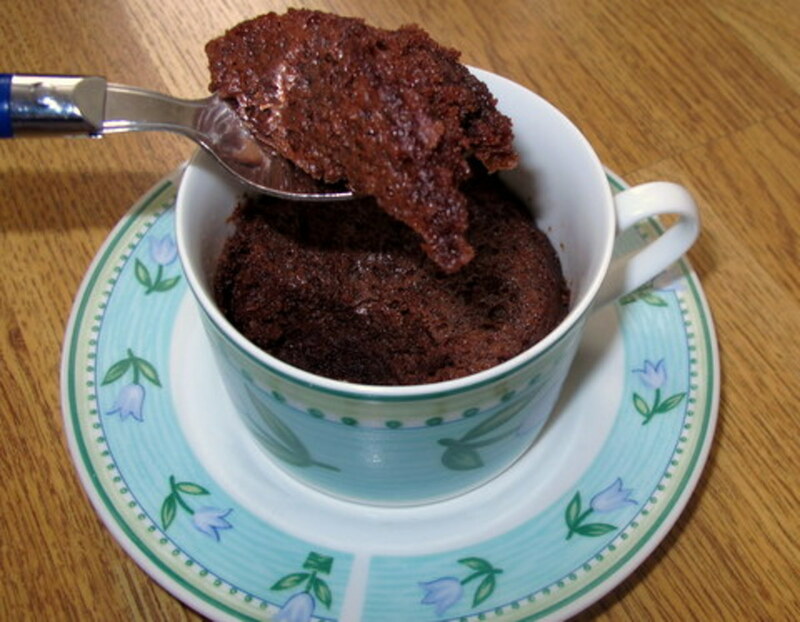 Quick Microwave Brownies in a Mug Recipe amazing and looks so delicious with such simple steps sounds lovely. Deborah-Diane, I'm so glad you're going to make this for your grandchildren. Happy baking! My grandkids are going to love this recipe! Oldiesmusic, this is a very popular and easy recipe. Enjoy! Thelma Alberts, these microwave brownies really are quick and they´re just as delicious as oven-baked brownies. Thanks for the vote and pin! OMG! It´s so quick. I can´t wait to try this. Thanks for sharing. Voted up and pinned for later use. RTalloni, this brownie is something you can offer to drop-in guests. It´s also great for a sweet fix anytime. Enjoy and thanks for your comment! Such a neat hub on the mug dessert idea. Thanks for so many tips with these recipes. The UK conversion is a real bonus here! 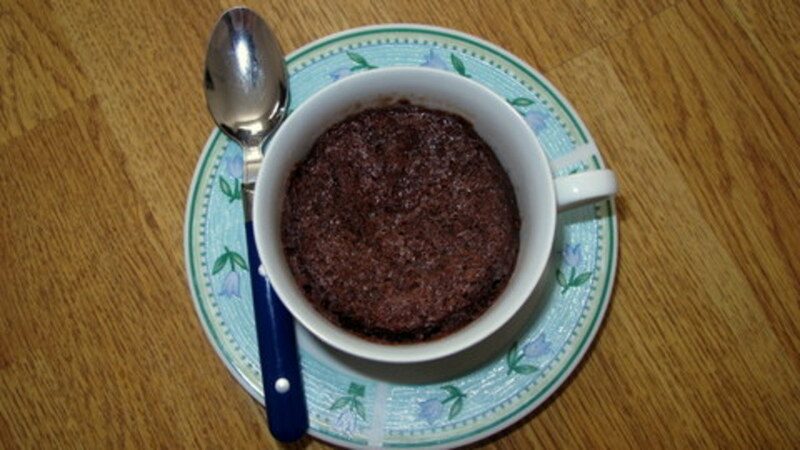 Any chocoholic will love microwave brownies...quick & easy and not too much so you're not tempted to overindulge. GetitScene, thanks for coming by! Oh yeah, the wife is going to be a BIG fan of this! Voted up and useful. rebeccamealey, it is a great way to control the sweet tooth. And it tastes just like a real brownie, too! Hope you can try it sometime. Thanks for coming by. How unique. A brownie in a mug. I love this idea. This way I won't eat a whole pan full in one day! skperdon, I'm glad you enjoyed reading about making brownies in a mug! It's a great way to whip up a quick dessert. We just made some this week for some drop-in guests. : ) Thanks for your comment. Are you Kidding? I never thought of using a mug for anything but tea, coffee, hot chocolate, cocoa, soup, etc. I love this hub! Great job VespaWoolf! fahthef, I'm glad you're going to try these delicious mug brownies! They're fast, easy and make a delicious snack or dessert. Enjoy and thanks for the vote and share! alocsin, it's nice to see you around! Yes, this is a handy recipe and so easy for those who don't have cooking skills or an oven. Thanks for the votes! What an unusual and creative idea. Love the idea of just using the microwave, since my cooking skills are nil. This would be a great accompaniment to a tea or coffee party. Voting this Up and Useful. KenDeanAgudo, I hope you can try these brownies soon! Thanks! lindacee, I'm glad you're going to use this as your go-to sweet cravings recipe. It's nice because you don't have a lot of leftovers around to tempt you. My favorite way to eat it is with ice cream--enjoy! Thanks for your comment. tattuwurn, this is one of our favorite quick recipes. It's so easy and delicious--not much not to love here! Thanks for coming by and enjoy! Hi Vespa... I love this quick brownie! This could be my introduction to baking, hehehehe. JackieLynnley, thanks so much for your feedback! Peanut butter and chocolate chips--so yummy. That's one of my favorite variations. I'm glad you enjoyed these microwave brownies so much. I really appreciate your comment! Thank you so very much. No more leftovers! I may never bake another cake. Au fait, I'm glad you like the idea of packaged liquid eggs. They are easy to measure. Thanks for the stars! JackieLynnley, microwaves have a definite advantage over ovens during hot summers! NP and I will let you know, always wanted to learn to bake cake in the microwave, ovens get so hot in summer! JackieLynnley, thanks for your good eye! I really appreciate it. I've corrected the error--50-60 minutes would definitely turn out a brownie as hard as a rock!! lol Thought I must have looked at it wrong last night but glad I came back...you said minutes not seconds and I would assumed you meant 5-6 minutes and still ruined them. Sorry if I am still reading you wrong. Jackie Lynnley, I'm glad you're going to make these microwave brownies! After you've tried them, you may not return to the old-fashioned way of baking them in an oven. This is so easy and quick. Enjoy! You meant 5 to 6 minutes didn't you? pandula, I look forward to the feedback! Enjoy! Now this is something I would like to try! Will get back to you with a feedback. Thanks for sharing. DeborahNeyens, this is a great go-to recipe when you're in the mood for something quick and sweet. Thanks for the pin! What a great idea! I've pinned this recipe so I can find it when I'm craving something sweet. You're welcome, vandynegl. Always nice to meet another chocolate lover! Yum! Anything chocolate is right up my alley! Thanks for sharing this! ishwaryaa, thank you for your enthusiastic comment, votes, pin and share! I hope you enjoy these quick an delicious brownies. anglnwu, I'm glad you found this quick and easy brownie recipe useful! Yes, it is great in a pinch. Enjoy and thanks for everything! An irresistible and easy-to-make dessert recipe for brownie-lovers like me! Brownies in a Mug recipe is indeed a novel idea for those who like to whip up quick yet tasty treats. 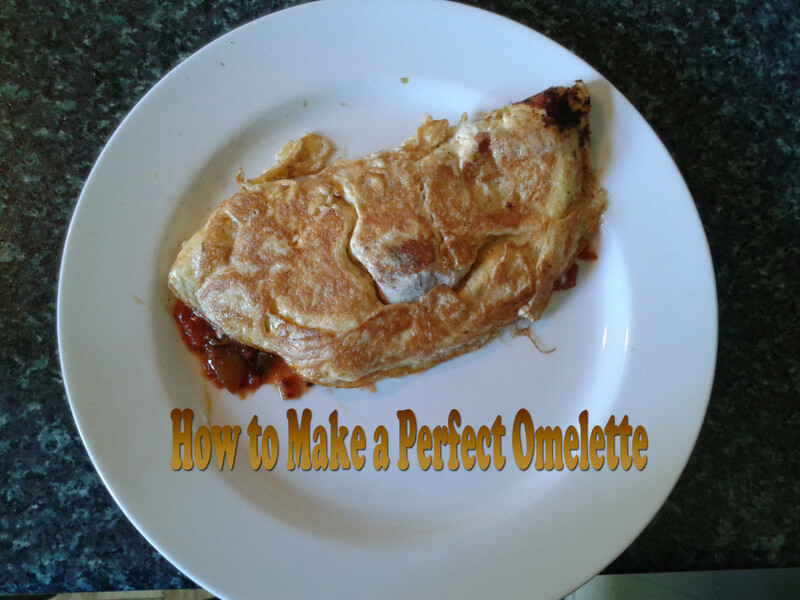 Clearly written instructions, helpful tips and delicious photos all made me more enthusiastic to try your recipe. Rated your recipe 5 stars! Well-done! I like this idea very much. A quick fix for any dessert occasion--I can use the trick. Thanks again for your interesting hub and rated up. InsightfulTiger, thank you for your kind words! You have to be careful with brownies because if you vary the ingredients too much, you end up with cake. : ) Thanks for coming by. tammyswallow, these brownies are dense, rich and chewy. I hope you can sample them sometime! I've tried mug brownies before but the recipe was different. I love the healthy ingredients that you suggest, and I can't wait to make these; especially with dark chocolate! Yummy! Mmmm.. I know what I will dream of tonight. Those look fabulous. It looks so dense and yummy. This is fantastic! Lastheart, I hope you can try these brownies soon! So yummy! Yummy...this just made us want one now! Thanks for sharing. Deborah-Diane, brownies a la mode. Yum! KoffeeKlatch Gals, I love your cake in a mug recipes. I hope you can try the brownies sometime. Thanks! Oh, my, this sounds easy and delicious! What a wonderful recipe! Add a spoonful of ice cream on top ... and it sounds like heaven! This recipe sounds really good. I love cakes in a mug, brownies can only be better. very useful quick snack for any moment. Too bad i don't own a microwave oven. Bookmark this hub when i get one soon. PeggyW, I'm glad this recipe works for you! I just made a batch tonight in 3 minutes flat. I'm getting fast at mixing it up! It really is nice a nice sweet treat for two. Thanks for your votes and pin! This recipe is perfect for us. Since it is just the two of us, often recipes are just too large and most of it has to be given away if it cannot be frozen in smaller parts. Can't wait to try this! I like the variations that can also be done with this. Going to check my pantry now for ingredients. Up and useful votes. Pinning to my cookies board. Kathryn Stratford, I'm glad you approve of this recipe. I just whipped up two of them tonight in 3 minutes flat! I'm getting fast. : ) I hope you enjoy them and thanks for your comment and share! This is a fantastic recipe, with lots of good tips and variations (which I love)! It's very quick and convenient, too. It is much better to whip one of these up than to spend a few dollars on the little ready-made bowl of brownie you can buy at the store. Thank you for sharing this with us! I'm sharing it! IslandBites, I hope you can try these brownies soon! They're so quick and easy, like microwave cornbread. Enjoy! Cool. I haven't tried chocolate cake. Yesterday I made cornbread in the microwave. Really quick and easy. pstraubie, I'm heading to the kitchen right now to make some mug brownies! They're perfect for the chocoholic and a great gift when you head to a friend's house. Enjoy and thanks for the votes and pin! O my...I am on a serious weight reduction plan and I see this. I am a true chocolholic....this looks so yummy. I wish I could reach in with a spoon and scoop out a bite. Yum. Om Paramapoonya, I hadn't thought of this as an eco-friendly recipe. Thanks! Now I need to make them more often! rajan jolly, thank you for the kind words! Sometimes we just need something quick and easy, but this one is delicious too. I appreciate all your support. Awesome recipe to dish out a treat in a jiffy. They are gorgeous and look so tempting. Thanks for sharing this. IndieJoe, what a great idea! I'll link this to my coffee ice cream recipe. Why didn't I come up with that?? You think like a true ice cream lover. : ) Thanks for the votes and all your support! Who knew this was even possible?! Can't wait to try this a la mode. I'm going to check the Vespawoolf recipes for some great ice cream ideas...something mocha should do the trick. Thanks for posting. Voted up. Way up! Truthfornow, I also enjoy this recipe since between my husband and I, we can't finish a whole pan of brownies. This is a quick way to satisfy a craving, too. Thanks for the vote and comment! Toytasting, I have never made the recipe without eggs but I'll try that next chance I get. If you have a chance to try it, please come back and leave feedback. Thanks for your vote and share! Like this idea very much ~ a way to have fresh brownies all the time. No more getting staled and dried out in the fridge. Voted up and useful.